Have you seen the newest Osprey Games Blue Cover Wargame? Rebels and Patriots is the 23 entry into this series and it is good. This rule set uses the same core engine as a number of Osprey Games and builds on them. The end result is a nicely done rule set playable in about an hour. If you are familiar with Lion Rampant, Dragon Rampant, or Pikeman’s Lament, you will recognize these rules and you will also notice some altercations to those rules. This game also builds on the rules from The Men Who Would Be Kings. Don’t worry, you don’t need any of those rule sets to enjoy this game. There are a lot of conflicts there to try out. Rebels and Patriots requires the rule book, 6 sided dice (about 12 per side should do it), measuring devices, terrain and your miniatures. The rules are written for 28mm miniatures based on 25mm round bases. That said, they do discuss basing larger numbers of miniatures on other bases and the rule set works with other scales too. The guys I watched play used 15mm miniatures to good effect. The game itself focuses on the skirmish engagements of the conflicts above. A typical force will contain 40 to 60 figures. 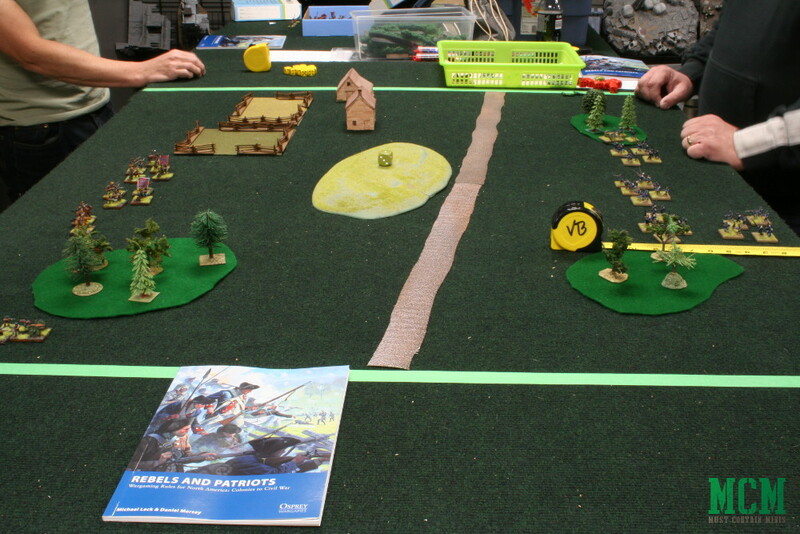 For table size, Rebels and Patriots encourages you to play on a 4′ by 4′ surface. 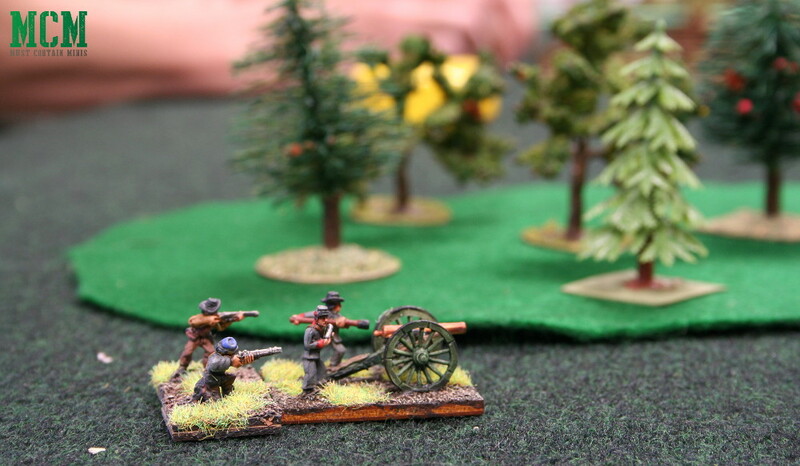 A picture from a Rebels and Patriots Battle Report on Must Contain Minis. One important element of the Rebels and Patriots is that you follow the development of an Officer through a series of linked games. That Officer represents you on the tabletop and you work your way from a Second Lieutenant up to a Major. You can do one-off battles if you wish, but I feel that you will get a better experience out of the game if you follow the career of your officer. As your Officer gains levels, he gains new random traits. Most of these traits are good, but some are bad – such as him becoming an alcoholic. The force you command doesn’t change too much, but my opinion is that you should be able to hand select which units to take into each missions without issue. I didn’t notice this too well stated in the rules. Some of the missions restrict how many points you can take, and some of the new traits rolled dictate which units you have to take in your force, so you are going to find yourself adjusting your force a little as the game goes onward. Units are purchased using a points system. The back of the book has suggested forces for each of the eras listed above. Being that this is a quick review, I am not going to go in depth about the rules. I will touch on a few of them though. To activate a unit, you roll two dice. After modifiers, you need to roll a six or better for that unit to activate. This activation number is the same across the board for all units, but the modifiers are different. In Dragon Rampant, if you failed a single activation for a unit, you forfeited the rest of your turn for all your units. This is no longer the case in Rebels and Patriots. Each unit gets a chance to activate once per turn. Attacking and movement are pretty straight forward. Flanking and Facing don’t matter too much unless you are acting in Close Order (which most units would have done back in those days) or are a unit with a Cannon in it. The description for this I found a little confusing in the book, but if you want a unit to fire without being in Close Order, you have a 360-degree line of fire from your unit. Building forces is very simple and you will be able to do your points buy on forces in your head. A standard game is 24 points, which is again roughly 40 to 60 miniatures per side. The scenarios in this book also add a lot to the game. In total, 12 are written up for the game. A Cannon team consists of four men and a gun. You can add two more to the team by taking a limber option. Image from Must Contain Minis. Overall, Opsrey put together a good solid product in Rebels and Patriots that is available on a budget. These rules will put you back just $20. Not bad at all and worth having in a collection if you like any of the periods above. The product is also doing well in sales. I read on Michael Leck’s Blog (one of the Authors) that Osprey Games is looking into a second printing of the game. That’s pretty good!!! If you want to check out a Battle Report and First Impressions Article to get a better feel for the game, I have one over on MCM. Come on over and check it out. Thanks goes out to Osprey Games for sending me a copy of Rebels and Patriots to Review. Thanks for reading and until next time, Happy Gaming Everyone!! !